Live the day as a baker. Click here to play! You'll serve up sweet treats and fill your pockets with some sweet cash. Cupcakes, doughnuts and iced tea are all on the menu so put on your chef's hat and get ready to bake up a fortune. Service please! If you're going to have a successful day at the bakery, you'll need to watch out for the service bell. It acts as a substitute symbols and will double all prizes when it appears in a winning combination. Everyone likes their sweets, so you'll have to keep on top of the banking. Spin up to five plates of doughnuts and you'll win 1000 times your original line bet. The same applies for a jug of iced tea. Two to five apples and your order pad will pay out up to 250 times your bet. The Bunko dice are an important part of this bakery. It's what sets you apart from your competitors. If you can three Bunko Dice, you'll win a number of free games, all of which will be multiplied according to your roll on the dice. 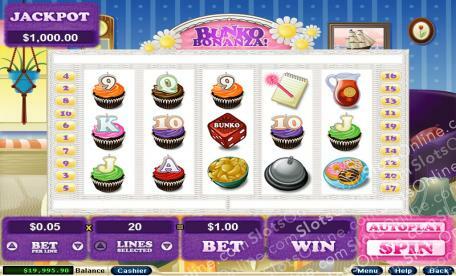 So, get into the kitchen at Bunko Bonanza and start cooking up some cash! The red Bunko Die acts as a scatter symbol. Three of these anywhere on the board will award you with 21 free games. During the free games, the prizes will be multiplied according to the number initially rolled on the Bunko Dice. If a bell substitues in a winning combo, you're prize will be multiplied by 12. 21 or five additional free games can be won during the free games. If you're lucky enough to roll the same number on the Bunko Dice during your initial free games, you'll get another 21 free spins. If not, you'll be awarded five free spins. The silver Bell acts as a substitute and will replace all other symbols excluding the scatters. Prizes are doubled when it appears in a winning combination.